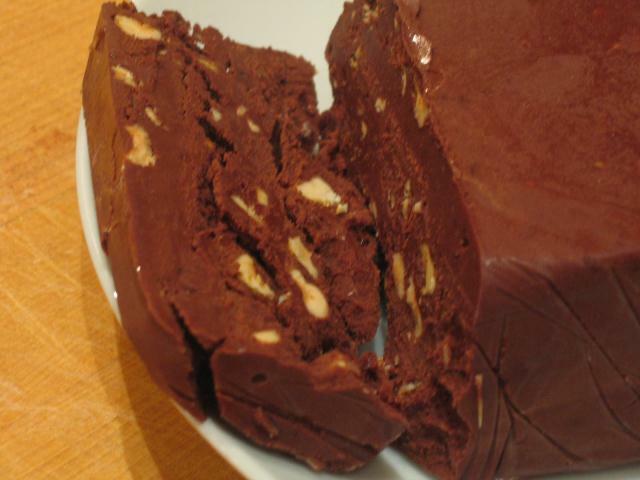 This is a very heavy duty chocolate cake…a huge slab of chocolate punctuated with praline and nuts. There is nothing light here, but much to enjoy. A Nigel Slater recipe, from the Observer. Toast 100g of shelled and skinned hazelnuts in a dry pan until golden. Keep the nuts moving – they’ll burn in an instant. Put 80g of caster sugar in another pan and heat over a moderate flame until melted. Watch the pan like a hawk – the sugar will burn faster than the nuts. When the sugar has melted and turned into a caramel, add the nuts and quickly tip the lot out onto an oiled baking tray, spreading the mixture evenly. It will set quickly. Melt 350g of the best dark chocolate you can get your hands on, minimum 70 percent cocoa solids in a bowl over a pan of hot water. Don’t stir it around too much. Just let it melt. When the chocolate has melted, add a couple of tablespoons of hot water and then 85g of diced butter. Nigel beats his butter until soft, but I played fast and loose with his learned instructions and just chopped it up a bit and dumped it into the chocolate, mixing it a couple of times to amalgamate everything. Nothing came to any harm. Add a small (or large) amount of rum to the chocolate, if you’re so inclined. Next, whip 170ml of double cream until the peaks are soft and fold into the chocolate. Put the by now rock hard praline mixture into a plastic bag and batter with rolling pin until well broken up. Aim for ‘large gravel’ rather than ‘dust’. Mix the praline into the chocolate. Pour the mixture into a bread tin lined with clingfilm and refrigerate overnight or until properly set. The cake should slip easily out of the tin onto a waiting plate. The cake is rich and heavy, and should be served in thin slices. You won’t be able to eat much in one go.